The Sentry brand is owned and distributed exclusively by Sealed Performance Batteries. All Sentry products are sourced from only high quality manufacturers and backed by the Sealed Performance Batteries name synonymous with consistency and quality. The Sentry brand provides endurance and ultimate power in the harshest of environments as well as protects against unwanted power failure. 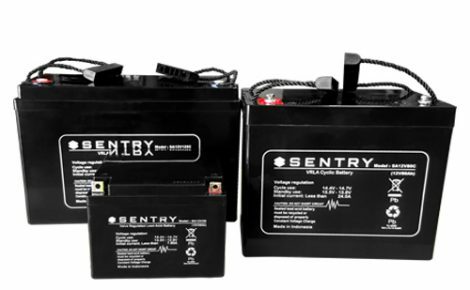 The sentry range includes high quality and performance, competitively priced batteries across a number of technologies for a wide range of applications. Manufactured specifically for the harsh Australian conditions, the Sentry Longest golf cart range are already gaining traction across not only Golf cart applications but also other deep cyclic applications such as scissor and forklifts and electric mobility devices. The Sentry AGM range is a quality range ideally suited for a wide range of general purpose and cost critical applications. Our Sentry AGM range has very low internal resistance, is capable to deliver high currents on demand and offers a relatively long service life, even when deep cycled. The Sentry AGM range is maintenance and spill free, provides strong reliability with a low self-discharge. When comparing LiFePO4 to other Lithium technologies there are some distinct safety advantages. These advantages include greater tolerance to both high temperatures and abuse such as overcharging, short circuit and penetration. As a result of these features the risk of fire is extremely low even under harsh circumstances. The Sentry Lithium range comes with all the benefits of LiFePO4 composition in either the standard 12V SLA case sizes and 24V sizes for larger applications. The Sentry brand is one of the only Lithium products on the market to carry IEC Certification for both the BMS and Cell combination.